Tooth bonding is a type of cosmetic dentistry that is used to improve your smile and can help repair damaged teeth, fill in gaps, change the shape of a tooth, or improve the appearance of teeth that are discolored. Bonding can also be used to help preserve the root of a tooth that has become exposed due to receding gums. Dental bonding is a process in which a dentist uses a tooth colored composite resin material and molds and shapes it to achieve the desired effect. Then, they attach it to your tooth. The process is relatively simple compared to other cosmetic procedures such as dental implants which requires dental surgery. Dental bonding can typically be completed in one visit. Your dentist will select a composite that matches the color of your existing teeth. Once the correct color has been selected, your dentist will prepare your teeth by roughening their surface and applying a liquid to help the bonding stay in place. They will then use a special ultraviolet light to harden and attach the dental bonds. Once the dental bonds are attached, they will make any necessary adjustments. Your dentist will polish and shape your teeth until they are just right. Your pain and discomfort with this procedure should be tolerable. Dental bonding should be a relatively pain free procedure because your dentist is working on the surface of your teeth, which is not prone to sensitivity. That being said, some patients experience increased sensitivity due to tooth or gum decay. 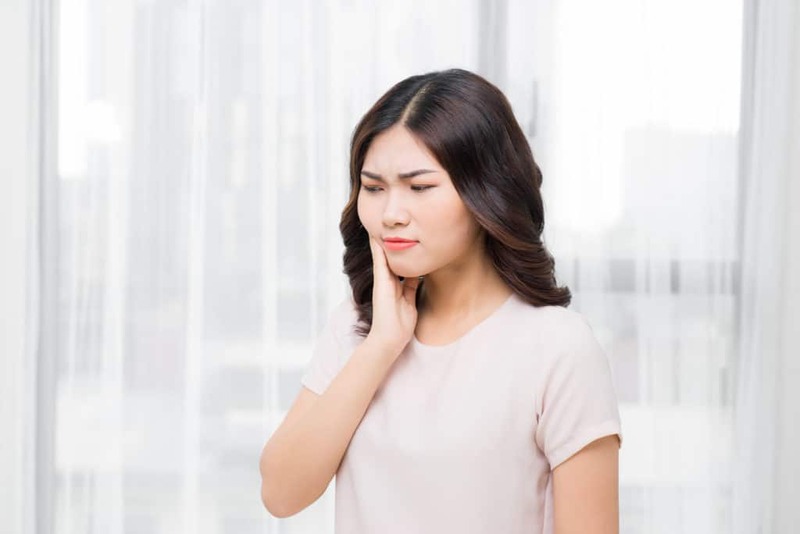 Depending on your tolerance and if you are having any additional dental work done at the same time, your dentist may recommend that you take an over-the-counter pain reliever prior to your visit. They may also apply a topical anesthetic to help with any tooth sensitivity or discomfort. In extreme cases, anesthesia may be used to help patients with anxiety. If you are a patient who is naturally anxious when having dental work done or you have a low threshold for pain, please vocalize your concerns. We are always conscious of our patients comfort but can take additional steps to make your experience as pleasant as possible. We will work with you to make sure that dental bonding and any other procedure performed at our office, does not cause undue pain or discomfort. It is important to have any other dental work that may impact the color or shape of your teeth completed prior to dental bonding. Your dentist will carefully match the bonding material to your existing teeth, so if you plan on whitening your teeth or are having any other cosmetic procedures, make sure to complete them prior to dental bonding. Dental bonding requires special maintenance care. The bonding material is not as strong as your natural teeth so it can be chipped and damaged. The material is also susceptible to staining. If you have selected dental bonding to improve the coloration of a tooth, you should limit exposure to tea, coffee, cigarettes and red wine; especially during the first 48 hours after the bond is applied. Good oral hygiene is also important to maximize the longevity of your bonding and maintain the health of all your teeth and gums. Brushing twice a day and flossing daily can go a long way towards keeping your mouth happy and healthy and help your dental work last longer. Bonding is traditionally an affordable option. Where procedures such as dental implants can run several thousand dollars per tooth, dental bonding averages around $300 – $600 per tooth. This makes bonding a much more affordable option for many. In addition, insurance may cover a portion of the cost if the bonding is deemed structurally necessary. Dental bonding may be a fantastic solution to fit your needs. If you are concerned about the application or dental bonding pain, contact our office. Our team will work with you to make your experience as comfortable and pain free as possible. ← Dental Bonding or Porcelain Veneers: Which is Best For You?